At Myers Orthodontics, we pride ourselves on providing high quality orthodontic treatment in a fun, friendly office environment. Dr. Myers and our highly trained team of orthodontic specialists work hard to treat every patient on an individual level, designing specialized treatment plans that perfectly suit each patient's unique orthodontic needs. Many people think of braces as something specifically for teenagers - and while many of our patients are teens, we treat more adults than you might realize. More and more adults are discovering the magic of orthodontic treatment, and it's little wonder why. A new smile imparts a boost of confidence, happiness, and self-esteem that radiates through every area of a patient's personal and professional life, and modern braces are thinner, lighter, and more comfortable than ever before. Plus, with revolutionary treatments like Invisalign, no one has to know you're straightening your teeth except you and Dr. Myers! We can move healthy teeth at any age, but adult treatment differs from adolescent treatment in two major ways. First, jaw development is complete in adults, so structural changes to the face and jawbones can't be achieved in the same way for adults as they can for children. Second, adults are at an increased risk for periodontal disease, and diseased gum tissue can make it impossible to safely move teeth. Accordingly, any instances of gum disease need to be brought well under control before adult treatment begins - but don't worry, this just requires diligent professional and at-home cleaning. 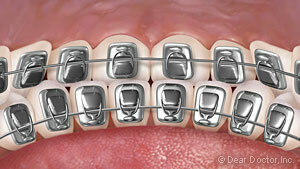 Traditional Metal Braces — This is what most people think when they hear the word braces. Made from small metal brackets bonded to the front of teeth and a thin arch wire running through them, they offer a classic, reliable, and cost-effective way to get a new smile. Clear Braces — These use the same basic function of braces, but instead of stainless steel, the brackets are made from a clear ceramic composite material, letting them blend in with surrounding teeth - and making them hardly visible. 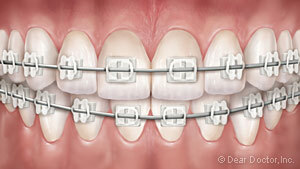 They offer obvious aesthetic benefit its, but they are also more fragile and slightly more expensive than regular braces. Clear Aligners/Invisalign® — Invisalign® does away with metal wires and brackets altogether, instead relying on a series of clear, removable plastic trays, called aligners, to straighten teeth. The aligners are virtually invisible when worn and can be popped in and out to eat, drink, brush, and floss, so virtually no one will know you're straightening your teeth, you can still enjoy your favorite foods, and maintaining oral hygiene is a breeze. 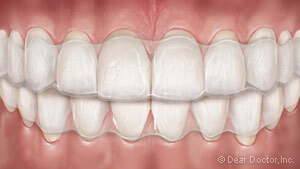 Due to its convenience and discreet appearance, Invisalign is one of our most popular options with adult patients. 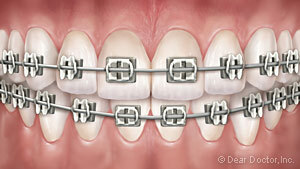 Lingual Braces — These metal braces offer the same strength and reliability of traditional braces, but they're completely invisible to the outside because they're bonded to the inside (tongue side) of teeth. While they're completely invisible, they're also more expensive than traditional braces and require a longer adjustment period. We know you'll be ecstatic once you get your braces off, but you're not out of the woods quite yet! While your teeth have moved positions, the tissues and ligaments supporting them have yet to adapt to this new positioning, so without a retainer, they'll just drift back to their old positions - erasing all your hard work! When we take your braces off, we'll fit you with a retainer that will help keep your teeth in their new positions, protecting your smile for years to come. Have more questions about the types of treatments we offer or ready to start towards a new smile? We're so excited for you. Feel free to call us at (865) 687-6560 or use our easy online form to schedule a complimentary consultation at one of our Knoxville, TN offices. We can't wait to hear from you, and we look forward to helping you achieve and maintain a healthy, beautiful new smile!